Maintaining cortically selected movement amplitude i.e. the frontal cortex is involved in the choice of movement, after which the basal ganglia takes over and communicates with the other areas of the brain. The scale of a required movement is then calibrated the through sensorimotor integration. For example, a person may start to walk with normal step length but if amplitude is incorrectly executed, their steps soon become shorten, progressing to a shuffling gait. For a person to perform activities of daily living, the basal ganglia need to be working properly. Impairment affects both mental and physical agility as described by motor and non-motor symptoms. Parkinson's was primarily thought to have motor symptoms only and the non-motor symptoms symptoms were managed separately. The Hoehn and Yahr scale is commonly used to describe how the motor symptoms of Parkinson’s progress. The original scale was published in a 1967 article by Melvin Yahr and Margaret Hoehn, and included stages 1 to 5. 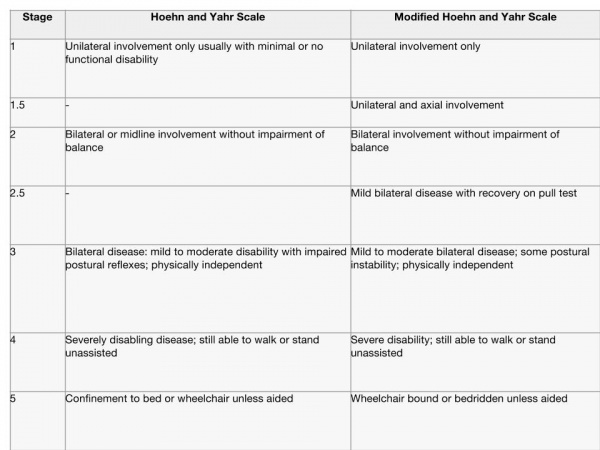 Since then, a modified Hoehn and Yahr scale has been proposed with the addition of stages 1.5 and 2.5 to help describe the intermediate course of the disease. As noted in the H&Y scale, at diagnosis, these signs are usually unilateral, but they become bilateral as the condition progresses. 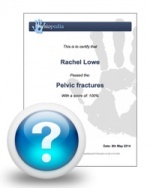 Later in the course of the Parkinson’s additional signs may be present including postural instability (e.g. tendency to fall backwards after a sharp pull from the examiner - the ‘pull test’) and orthostatic hypotension (OH). 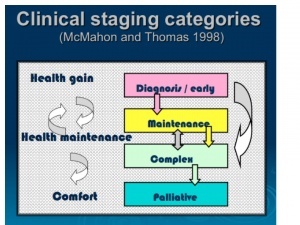 MacMahon and Thomas (1998) have provided a clinical staging classification. The model is based on four stages of progression from a state of gaining best health, through to the requirement of support and comfort - diagnosis, maintenance, complex and palliative. Unlike the H and Y scale, there is more fluidity with this model, allowing for periods when the person might deteriorate during an illness, whether related to Parkinson’s or not e.g. chest infection, rehabilitation, post fall and fracture, but regains prior ability on recovery. Non-dopaminergic and non-motor symptoms often present before diagnosis of Parkinson’s, and almost inevitably emerge as the condition progresses. They often dominate the clinical picture of advanced Parkinson's, contributing to disability, impaired quality of life, and shortened life expectancy. Cognitive:thinking, reasoning and decision making skills are usually affected. problems in multi-tasking, concentration, learning and remembering, understanding and using language, planning and carrying out activities. Physiological: pain, genitourinary problems, constipation, excessive sweating, drooling of saliva, restless leg syndrome and irregular heart beat. Rochester et al (2013) provide an extremely useful table detailing key diagnostic criteria of various movement disorders that help us assess for and recognize and common features in differing conditions. For physiotherapy-relevant information, refer to the European Physiotherapy Guideline for more information, including a breakdown in Table 2.5.2 on page 25 of the sub-types of Parkinson’s. 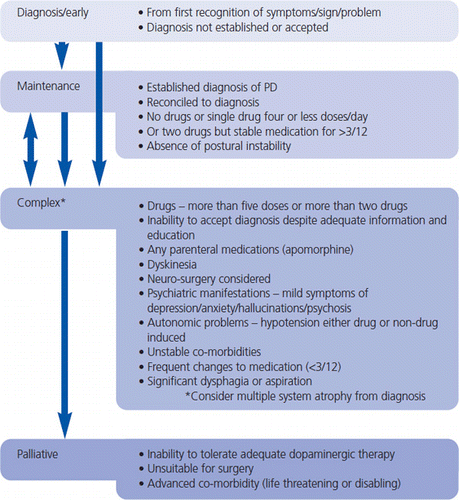 Although there is no single way to diagnose idiopathic Parkinson’s accurately whilst a person is living, separating this from the various causes of atypical parkinsonism might be done based on clinical presentation. The following Medscape page www.medscape.com/viewarticle/761283 explores a systematic, clinically based three-pronged approach to assist clinicians in establishing the correct diagnosis in the consulting room. The EPDA’s Life with Parkinson’s is an awareness-raising campaign that aims to highlight the lack of understanding and knowledge concerning Parkinson’s that exists throughout Europe today through the provision of educational materials. The first part of the campaign, launched in 2008, focuses on highlighting the importance of an early diagnosis as well as advanced disease management. The second part of the campaign, launched in 2010, focuses on the disease’s non-motor symptoms and demonstrates the complexities of Parkinson’s. The third part was launched in 2012 and addresses the necessity of an accurate diagnosis and the importance of the right treatment for the right person at the right time. The materials for the awareness campaign consist of booklets and two videos that feature case studies and treatment options as well as further evidence of the economic and social impact of the disease. There is also a Dopadoc Parkinson's computer graphic by Ken Giuffre in which the main character Marshall, visits his neurologist to gain key info about 10 of the often-overlooked non-motor symptoms that anyone concerned about Parkinson's disease should know about. Quick Reference Cards In addition to the new Quick Reference Cards in the European Guideline, UK-specific cards can still be viewed for consideration. Reference and source: Ramaswamy B, Jones D, Goodwin V, Lindop F, Ashburn A, Keus S, Rochester L, Durrant K (2009).Quick Reference Cards (UK) and Guidance Notes for physiotherapists working with people with Parkinson’s disease. Parkinson’s Disease Society, London.